From September 11-17, 2016, Nick Aiello-Popeo shared some photos and stories with the #alpinistcommunityproject. 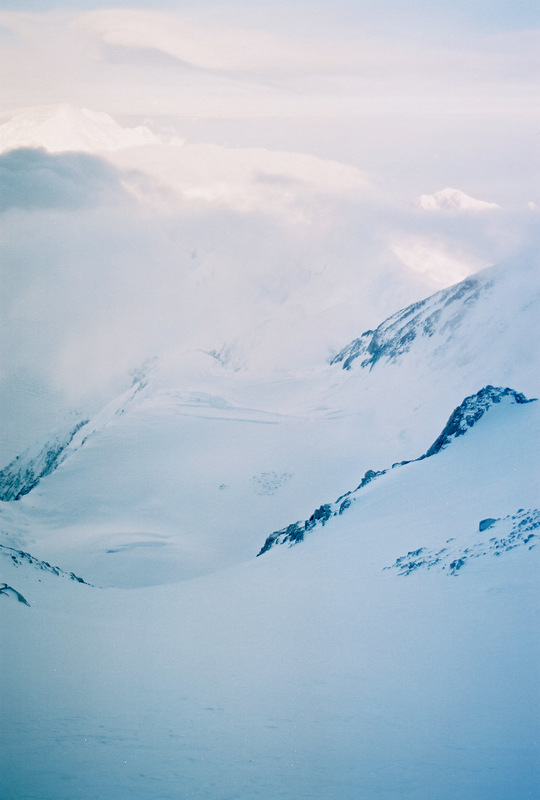 Aiello-Popeo made his first trip to Talkeetna, Alaska, at the age of 20. The trip catalyzed him to become a full-time climber. He now lives with his wife in New Hampshire, where he guides in North Conway. He returns to the Alaska Range for two to three months every year. My first trip to Alaska was an unmitigated adventure. To save a few bucks, my buddy Paul Calabro and I drove nearly 5,000 miles across the US and Canada, entering Alaska after venturing up the wild Al-Can Highway through the Yukon Territory. We proceeded to get seriously schooled in the art of Alaskan expedition climbing on Denali's West Buttress (20,310'). 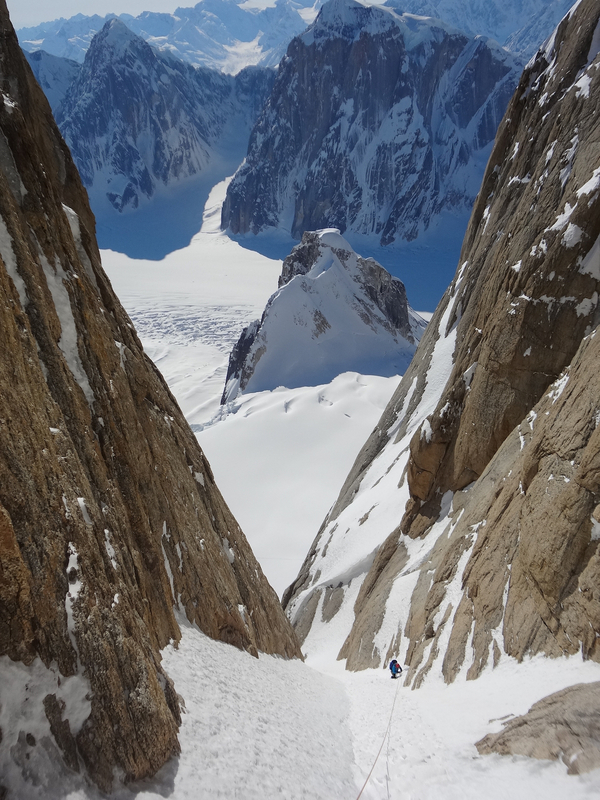 At the end of the trip, I attempted to summit via the Messner Couloir, a steep snow and ice gully towering 5,000 feet directly above the 14,200-foot Camp. 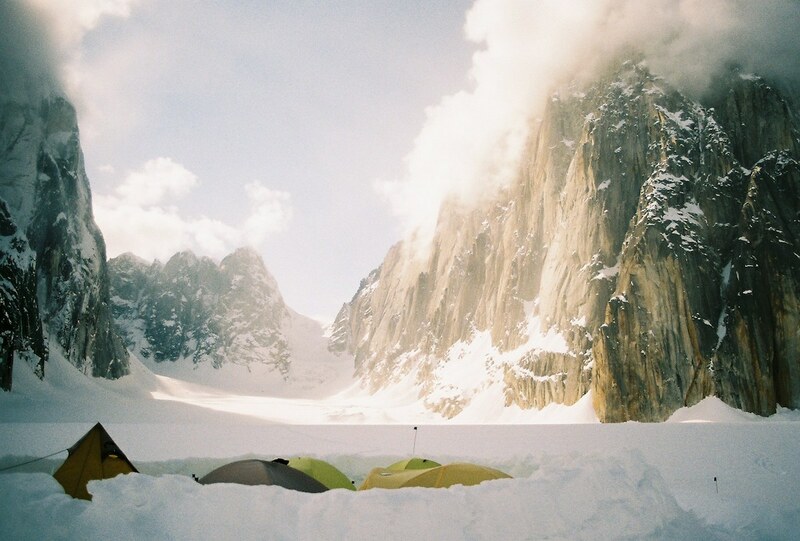 Alone in the early morning, I snapped this picture on my old 35mm camera, showing the dozens of tents down at 14 Camp looking like flakes of pepper on the snow. Somewhere around 19,000 feet, I started punching through a scary, hollow wind slab. Tantalizingly close to the top, I bailed in a long, descending traverse. Paul Calabro seconds a pitch near the top of the Ham and Eggs couloir, on the Moose's Tooth (10,335'). This was my fourth straight year climbing in the Alaska Range, and I finally felt like a was getting a handle on the vagaries and challenges of climbing in such an unpredictable place. 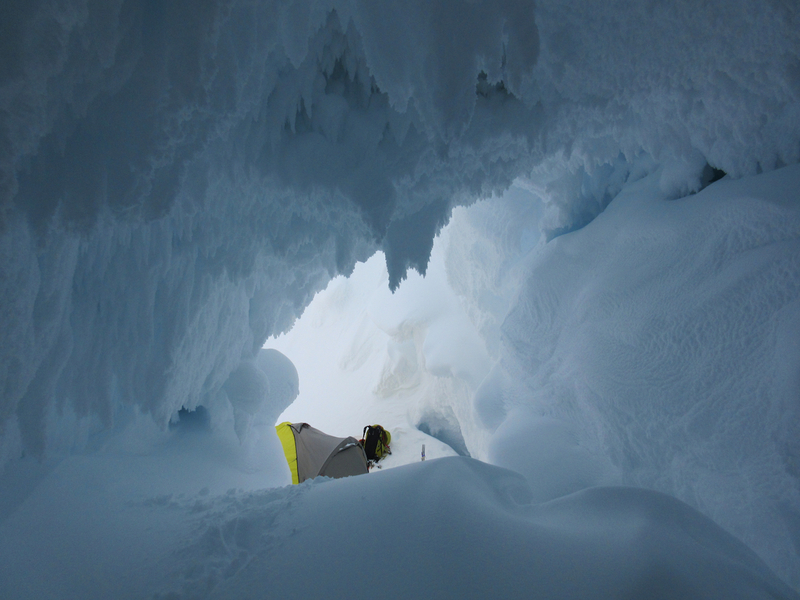 Ham and Eggs (WI4 M4, 3,000')—a veritable trade route—was in horrifying condition that April, with cruxes of hollow eggshell ice and vertical sugar snow. Together with two other teams camped below the route, we threw away the guidebook and took turns finding our way up a route very different than we had expected. 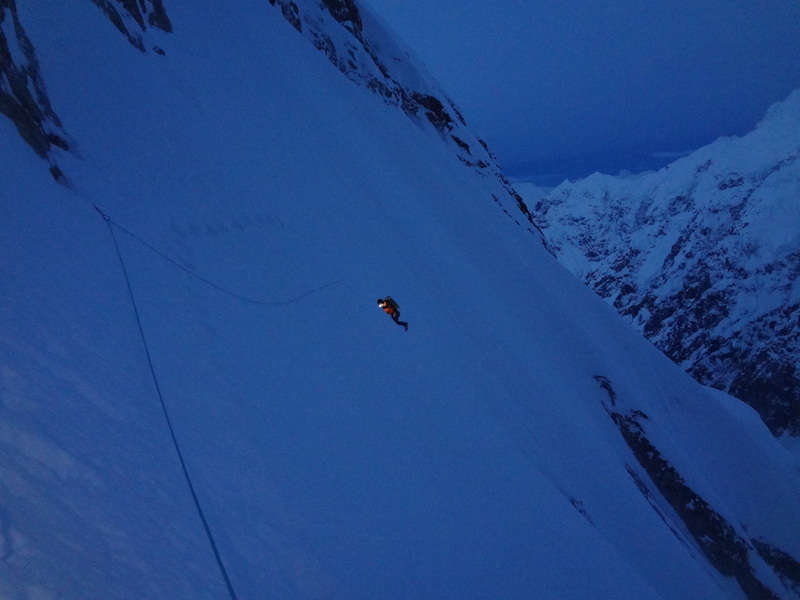 A client descends Washburn's Ridge at 17,000 on Denali, under the midnight sun. Guiding Denali is the most physically and mentally challenging work I've ever done. I often ask myself why I return every year to guide back-to-back Denali expeditions, in addition to my own climbing. Even after eleven trips up the mountain (for a total of about 220 days on the hill), the camaraderie of fellow guides and these beautiful vistas keep me motivated. "I can't see a thing, this is fucked!" The night before this picture was taken, Rusty Meyer and I were struggling to find our way along the sinuous spine of the Sultana Ridge of Mt. Foraker (17,402'), through yet another storm. Without saying a word, we both began searching for a crevasse to take shelter in. When the morning dawned cold and clear, we were treated to this incredible view north, with the tundra stretching to the nearby Arctic Circle. Storm clouds clearing above 747 Pass in the Ruth Gorge. For our second trip to Alaska, Paul and I recruited our buddies Reggie and Nick to come explore the Ruth's storied alpine routes. 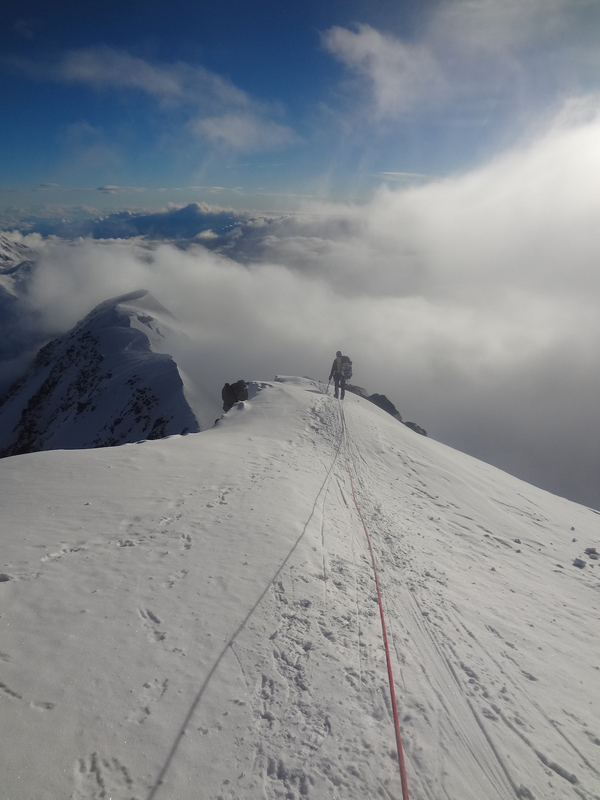 For the second time in a row, adjusting to the massive scale of the Alaska Range was a formidable challenge. At various points, vertical snow, avalanche danger, and my unintentional nighttime journey into a crevasse stymied our efforts to top out a big route. But these learning experiences can't be found in a climbing skills book or downtown rock gym. Rusty Meyer approaching the base of the Nettle/Quirk route on Mt. Huntington (12,241'), during a 24-hour push of the route. A recent dump of almost 10 feet of snow produced some horrendous slogging conditions on the lower-angle terrain, but we soldiered on with stubborn determination. High on the mountain, we pulled onto the summit ice field to find a sudden change in conditions: perfect snice led upwards into the clouds! Psyched for our good fortune, we simulclimbed quickly towards the summit ridge. But just before gaining the ridge, I found myself wallowing again, in unstable neck-deep snow: In the flat light, I had waded straight through a 4-foot avalanche crown line! We beat a hasty retreat. The inside of Mt. Crosson (12,352'). During a very stormy alpine-style attempt of Mt. Foraker's Sultana Ridge, Rusty Meyer and I frequently found ourselves looking inwards, in more than a metaphysical sense. 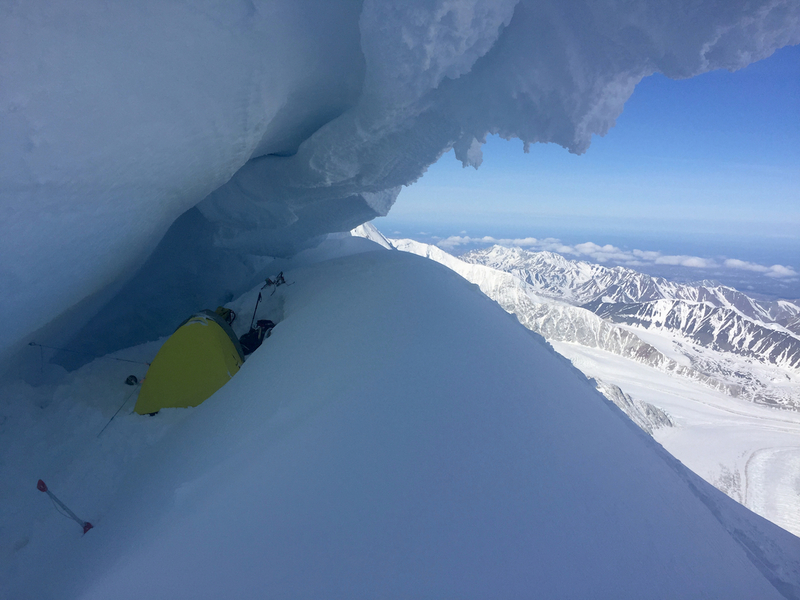 Considering whether one is at greater risk from avalanches (if bivying on the face of a mountain) or crevasse collapse (if bivying inside) is just one of the many charming peculiarities of Alaskan climbing. Despite all these years of adventure in North America's biggest and baddest alpine playground, I still find myself amazed by grandeur and seriousness of my second home, the Central Alaska Range.